As you may already know, I’ve written some books including “Programming the Mobile Web” from O’Reilly Media. As a reader, it’s great to see great opportunities to get this books with discount. Today 11-29, O’Reilly is offering a great promotion –60% off of ebooks and videos– in celebration of Cyber Monday. This promotion includes “Programming the Mobile Web” ebook and “High Performance Mobile Websites” workshop video. Today’s promotion: 60% off! Just use the discount code DDF2H after ordering your favorite ebook or video from O’Reilly catalog. Make your order here. 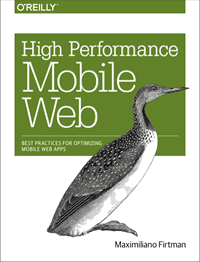 For those interested in mobile web high performance, the promotion also includes my last workshop at Velocity 2010 in Santa Clara, CA: “Mobile Web High Performance”, a 1:15 duration workshop in video. And remember, today all ebooks 60% off! Use the discount code DDF2H. Is the code in the book available anywhere for download? Which code do you need? There isn’t too much long code on the book.